Accueil Produits Bande originale La bande originale de “James et la pêche géante”. La bande originale de “James et la pêche géante”. Sortie : 12 avril 1996. Film : James et la pêche géante. My Name Is James (par Paul Terry) – 2:38. That’s The Life (par Jeff Bennett, Susan Sarandon, Jane Leeves, Miriam Margolyes, Simon Callow et David Thewlis) – 1:59. Eating The Peach (par Jeff Bennett, Susan Sarandon, Jane Leeves, Miriam Margolyes, Simon Callow, David Thewlis et Paul Terry) – 2:54. Family (par Simon Callow, Jeff Bennett, Jane Leeves, David Thewlis, Susan Sarandon, Miriam Margolyes et Paul Terry) – 2:43. 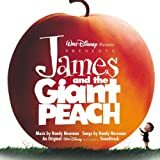 Main Title: James And The Giant Peach – 0:37. Spiker, Sponge, and a Rhino – 3:24. Into The Peach – 2:04. James Makes Some Friends – 1:08. The Peach Rolls – 2:37. All At Sea / That’s The Life (Reprise) – 2:12. 100 Seagulls and One Shark – 1:58. Way Off Course – 1:47. The Rhino Attacks – 2:50. Empire State Building – 2:17. New York City – 2:53. Spiker And Sponge Come To America – 2:15. A Place Where Dreams Come True – 3:58. Good News (par Randy Newman) – 4:20.